The future of NHS email on mobile phones: Apple, BlackBerry or some other flavour? d4 were fortunate to have a face to face meeting this week with NHS Connecting for Health (NHS CFH), part of the Department of Health Informatics Directorate. Their role is “to maintain and develop the NHS national IT infrastructure”. 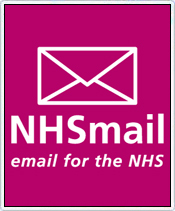 We had the opportunity to ask about latest progress on the roll out of NHSmail, the centrally managed Microsoft Exchange 2007 solution for the NHS in England and Scotland, and to find out how many users were accessing NHSmail using a mobile device. Our focus at d4 is to increase the acceptance and affordability of mobile phones for health care professionals. So naturally we’re interested in understanding the status quo and what the future might hold in terms of mobile email for the NHS. If the operating system (OS) on the device is upgraded, from a NHSmail point of view it looks like a new device. So devices with an OS that is regularly upgraded by their manufacturer and easily carried out by the user (e.g. Apple) fall foul of double counting. If a user takes a new device, they may not de-register the old device. So given many individuals replace their phone every 12-24 months, in any one month 4-8% of perceived user growth might actually be due to users upgrading to a new device. Also, there is likely to be a very large skew here compared to the actual use of email on mobile devices by NHS employees in the wider sense, for two, potentially related, reasons. NHSmail is not used by all NHS employees. Many NHS Trusts still maintain local email systems for a variety of reasons. NHSmail may have hit the 600,000 registered mark, but with approximately 1.4 million employed by the NHS, the system still covers less than half of the total worker population. Accessing NHSmail on a mobile phone requires ActiveSync. This Microsoft solution for wireless transmission of email is not built-in to all devices – the obvious gap being Research In Motion’s BlackBerry smartphones. NHSmail: blowing a raspberry at BlackBerry? The data also showed a very low proportion of Research in Motion’s BlackBerry smartphones setup to access NHSmail, even though these devices occupy the #2 position in terms of global smart phone sales, according to Gartner. This didn’t surprise us however, as BlackBerry devices do not come with ActiveSync. Why BlackBerry devices don’t natively support ActiveSync is perhaps obvious: Research In Motion (RIM) probably see it as a competitor to their BlackBerry Enterprise Server (BES) product. The fact that RIM and Microsoft don’t quite see eye-to-eye on this might be why some local Trusts haven’t migrated to NHSmail: if they have already invested in BES architecture, they may be unwilling to pay for further client licenses or integration costs to make NHSmail work for their users in the short term. We’re not aware of any technical reasons for why NHSmail doesn’t support BES alongside ActiveSync on Microsoft Exchange 2007, yet CFH must have decided it wasn’t worth pursuing. A large number of health care workers use personal devices at work. We’re not aware of many large scale deployments of Apple equipment within public sector healthcare, so this would suggest many NHS employees carry and use personal devices at work. The recent d4 survey into the usage of mobile phones by health care professionals will allow us to test this hypothesis (results will be published later this year). Local Trusts don’t allow personal devices on their infrastructure for security reasons. Therefore users are signing up for NHS.net email addresses to get round Trust’s security concerns, allowing them to communicate with colleagues via NHSmail on their personal device. We’ll keep a watching brief for any NHS Trust policy decisions for or against particular devices. Apple devices are the preferred mobile device for NHS workers. Apple products offer strong competitive advantages: large touch screens, intuitive user interfaces and a wide range of apps. Again, the d4 survey should help answer this one. There’s a strong correlation between first adopters and Apple users. It’s possible that those users keen to get NHSmail on their mobile are also the same users who were the first to buy an iPhone or iPad from Apple. We’ll have to wait and see if this is the case. NHS email on a mobile device: what does the future look like? So to summarise, we think Apple products might be a common platform for mobile access to NHSmail, but we wouldn’t be surprised if the BlackBerry device was the most common choice for NHS email systems that haven’t migrated to NHSmail. This leads us to conclude that the status quo is finely poised with neither platform guaranteed to win. Before we turn to the future, some perspective: the proportion of NHSmail users registered to access email via a mobile device is still very low at less than 7% (the true figure will depend on the degree of double counting in the data supplied by CFH). But it looks to be on a strong upward trajectory, growing by 3x over the course of a 12 month period (without adjusting for any double-counting). With growth of this order of magnitude, and some uncertainty around the quality of the data, it would perhaps be foolish to predict how this picture might develop in the coming months and years. However we would be very surprised if Apple’s share of NHSmail mobile access increases in the face of strong competition from Android, BlackBerry and the largest manufacturer of mobile phones in the world, Nokia. One major threat to the device manufacturers leading the charge on NHSmail would be greater support for ActiveSync by their competitors. Apple devices have this built-in and Nokia already offer this on their E series Symbian phones, so the gap is biggest for Android and BlackBerry devices. Native support for ActiveSync on the latter seems unlikely, but as demonstrated by the release of BES Express this year, RIM will do whatever it takes to maintain their market share. What might be more damaging to manufacturers’ sales would be healthcare organisations becoming more vocal about security concerns. RIM recently announced they are collaborating with CSC to provide a BlackBerry smartphone solution for accessing patient records using an encrypted smartcard reader (a mandatory security requirement). It might be some time before Symbian, Apple or Android can demonstrate security credentials like these. Further challenges would be a more competitive market place for apps. Apple’s iTunes AppStore is a significant source of profits for the firm – not surprising given they take 30% of the value of every app sold in sales commission. Android Marketplace is probably hottest on Apple’s heels, while the BlackBerry App World is finally gaining momentum. 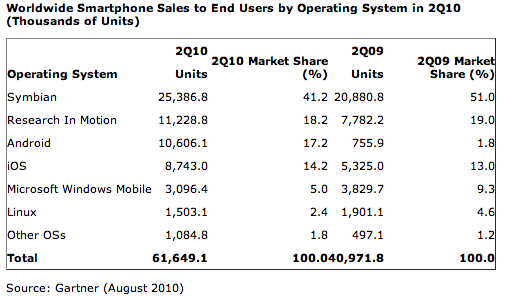 Nokia remains the sleeping giant. From our point of view, we are going to watch developments with interest so that we can reflect the current trends and offer what our members want. We recognise that supporting devices of different flavours will continue to be a key requirement. But our major takeaway from all of this is that the use case for different smart phones platforms in UK health care is complex. We want our members to make an informed choice when they choose their next handset, so we will continue to work hard on our market research and analysis to support them with appropriate, independent guidance. This entry was posted in Education, Evidence and tagged Android, Apple, BlackBerry, CFH, email, future, iPhone, NHS, NHSmail, Nokia, RIM. Bookmark the permalink.